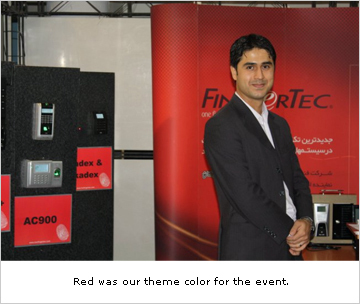 Recently the Iran Security System (ISS) Expo was held in the country from 19th – 24th December 2010, and FingerTec was represented well by their Iran partner. 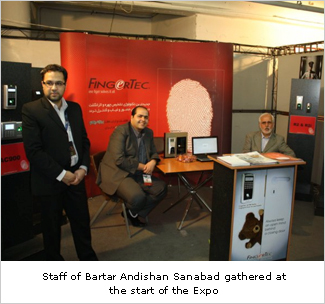 Bartar Andishan Sanabad, a FingerTec distributor in Iran who has been actively participating in various exhibitions across the region in the past two years, decided to participate in this expo which targeted a more specialized area of the security industry. 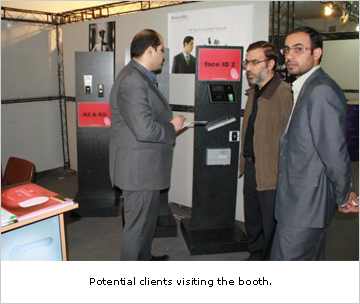 Equipped with various FingerTec models (M-Kadex, Face ID, TA300,keylock 8800), Persian translated brochures, and our 15 square metered-booth, we invited officials from different authorities in Iran to visit our booth in the expo. The expo had a total amount of around 8000 visitors, a surprising amount for a specialized industry, and those which stopped by the FingerTec booth were mainly from security departments of different companies looking for the most effective way of securing their offices. Although another 3 companies present at the exhibition had similar products, FingerTec still stood out among the crowd as it had the most variety in models and features than it’s competitiors. By the end of the show we received over 200 name cards and contact details of those interested in FingerTec, and several requests by companies wishing to be a FingerTec sole distributor in their respective states. Overall, the ISS Expo was a great move and we would like to thank FingerTec for their support towards us.